With most of us back and recovering from Spring Break, it’s time to do some damage control. 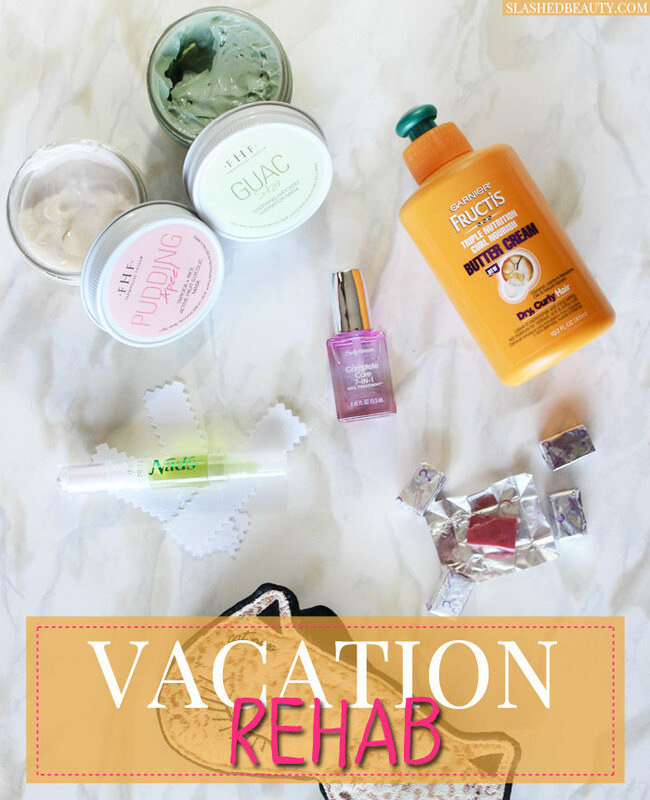 Sun, the pool, travel and just letting yourself be lazy can take it’s toll— but luckily, I’ve got you covered with five products that can be your personal vacation rehab. They’ll help you prolong the feeling of indulgence while hitting the reset button on your beauty routine. These delectable face masks will have you feeling like you’re still back on vacation, living it up on a spa day. Pudding Apeel is made with tapioca and rice, and improves texture while drawing out impurities and giving your skin a renewed feel after all of your vacation chaos. Guac Star soothes your skin with a boost of hydration, nourishing your skin with avocado butter, extract and oil to protect the outer layer of skin from the harsh environment with fatty acids and bucket load of vitamins. Neglected your nails while you were at play? This nail treatment is packed with a super good formula featuring avocado oil, sea salt, pomegranate extract and calcium to make your nails stronger, longer and shinier. It can help transform brittle, dry nails which I’ve been dealing with all winter, and whips them into shape to be healthy and manicure ready. I don’t know about you, but I let my eyebrows go over spring break. For a quick fix, I’m using the Nad’s Eyebrow Shaper to get them back to being defined and neat. The wand applicator makes cleaning up stray hairs around your eyebrows, upper lip, and chin super easy and precise, with up to 24 treatments in one tube. Sweet tooth, meet beauty-boosting supplement. The Neocell Biotin Bursts are yummy soft chews that deliver Biotin, the B-vitamin that promotes healthy hair, skin and nails. The acai berry gives them an awesome taste, plus protects the skin from free radical damage. I pop ‘em once a day for a little treat and to help repair damage that’s happened over the past season. These products will not only act as vacation rehab for your hair, skin and nails, but also help you with spring break withdrawal by investing some time into yourself as you get back into the swing of things. How do you get back into the swing of things after a vacation? Loved this article! The Farm House Fresh products have such cute names.